The committee has done their homework. They’ve found that Tom had been a useful half-back at teachers’ college. Their hope was that he would play again, or at the very least become a financial member. Now a golfer, and always an obstinate type, he refuses both requests. His stand finds no support among the cowering populace. Opposition proves futile. He eventually joins the Club rather than being sent to Coventry. “Everybody in Belluga plays football, thinks football, works football”…. “As soon as a new baby is born, before it is even registered with the C.P.S., its parents make it a junior member of the football club. Then, as soon as they are a few years old, we teach them to save their pennies to pay their own subscriptions” (p.211). Tom takes a interest in farming, befriending a local grazier, McDonald. Old McDonald may be the wealthiest person about, but he’s insecure, threatened by closer settlement whereby large grazing holdings are subdivided into smaller wheat producing farms. McDonald had donated £1000 to build new dressing rooms, as insurance. Tom also takes an interest in McDonald’s daughter Daphne, the most eligible girl in town. However the Club has plans that Daphne will marry Johnny Payne, their arch-rival’s champion fullback. Belluga will thus have a winning player at no cost. Daphne has shown interest, but Tom starts getting in the way. I let you guess the ending. Eric Otto Schlunke was primarily a farmer. His great passion was soil conservation for which a cup in his honor sits in the Temora Museum. He was also a prolific, folksy, writer whose characters were clearly drawn from daily life. Belluga is clearly based on Barmedman. Schlunke’s Road runs from Reefton just 10 miles to the south to nearby Trungley Hall, where the Zion Lutheran Church still remains central to community life. Barmedman was a village, dwarfed in size by its Maher Cup rivals. But it was never daunted. Schlunke’s story can be dated to about 1955, when his nephews Clarrie and Noel were members of the ‘Clydesdales’. This was a very good year. Barmedman travelled over to Boorowa and brought back the holy grail. The first defence against Junee produced a score of 72 to 3, the biggest margin ever in Maher Cup football. West Wyalong, Gundagai, Cootamundra and Grenfell all came, and were all thwarted. But arch rivals Temora drove up the straight road past the newly sown wheat fields, through Gidginbung and Reefton, and on to Barmedman. The red and whites, toughed it out, 16-10, and took the Maher Cup home. Barmedman’s players were mostly local farmers and wheat lumpers. But the club also attracted legendary players to their team, including Australian representatives Col Donohoe, and Ron Crowe, as well as Billy Bischoff, Keith Gittoes, Tom Kirk and Wally Towers. Is there any kernel of truth in Schlunke’s story which explains how the village was able to punch above its weight in Maher Cup football for so long? Perhaps there were special conditions operating in the village? One suspects that the club was in a relatively rare and powerful position where lack of size was overcome by an ability to extract extraordinary resources and commitment from the community. I’d be most interested in your thoughts. PS. 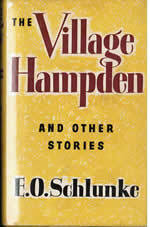 Why Schlunke named his short story The Village Hampden, is a mystery – Hampden is mentioned nowhere. Schlunke, E.O. (1958). ‘The Village Hampden’, pages 202-240 in the Village Hampden: stories, Sydney, Angus and Robertson. The book contains 16 stories, only this one about football. 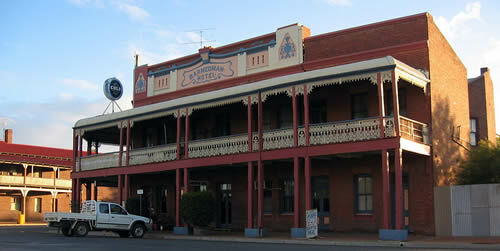 Barmedman Hotel, with the Queensland Hotel on the same intersection. Image Source: Mattinbgn, licensed under the Creative Commons Attribution-Share Alike 3.0 Unported license. This entry was posted in Places and tagged Barmedman, Eric Otto Schlunke, Fiction. Bookmark the permalink. The full text of you blog post on Barmedman didn’t come through but I noticed it here: http://mymahercupmemory.blogspot.com.au/ It’s great. Are you OK if I create a link to your blog entry from the Your Stories section of the Mahercup.com.au site? Terrific! I’m delighted you liked my little piece (from the heart, actually) – impossible to say how significant Barmedman was in my life then. So making the link is certainly OK. Thank you. Claire, I am apart of the last family of Regans in Barmedman. I will check on that for you. Arkie regan played in 1951. Sadly most of the names associated with the mahar cup are no longer in the town. Footy hasn’t been played here since the early 90s. There is still quite a good bond between the remaining 1974 team the only premiership team in Barmedman’s history. They still hold their 10 year reunions and for a few of the passing members they have worn their team blazer in respect at their funnerals. from Thomas Gray, ‘Elegy written in a country churchyard’. John Hampden seems to have been a major Cromwellian who died in a battle of the English Civil War, and was seen as a martyr for the cause.